Editor's note: Among admirers and devotees of Ramana Maharshi, Sam Wickramasinghe is exceptional, not only because he is Sinhalese by birth, but because he spent years among other devotees (in Kathirkamam) and in solitude (at Guru Madam, Kayts) endeavoring to penetrate into deeper and deeper levels of Yogaswami's multi-leveled deeds and utterances. Still lively and outspoken at 80, Sam is widely sought out by younger seekers for his colorful accounts of past experiences and exploits. He is also an accomplished writer, many of whose articles, such as this one, have appeared over the years in the Sri Lankan English press. In this article, Sam reminisces about his youthful encounters with Ramana Maharshi. When the now defunct Tata Airlines plane took me from Colombo to Madras in December, 1946, pleasure-bent, little did I realise then that it was to be the beginning of a more wonder-filled journey, finally bringing me to where I am now in an ashram! Sight-seeing from Madras, with camera slung over shoulder in full tourist style, I found myself one day in Brindavan Gardens, Mysore, in the company of some fellow citizens, one of whom was a balding Professor honeymooning with his bride. An evening saw all of us seated near Harding Circle, and there the Professor began talking about a friend of his one. Paul Brunton, with whom he had rowed in the English Channel and who was supposed to be staying in Mysore at the time as the guest of the Maharajah. Snatches of the con¬versation (which did not interest me at all) came to my eats, and I heard something about some books written by this Brunton and also some mention of a Maharshi although I did not even know the meaning of the word The Professor asked me whether I had read any of Paul Brunton's books, and when I said, 'no', he suddenly decided that all of us should make a visit to the Maharaja's palace the next day to look up his friend. Unfortunately the friend was out holidaying in another resort of the Rajah somewhere near the Himalayas and that ended Brunton, his books and the Rishi for me so I thought. About a year later, an office pal one day shoved a book in front of me and almost demanded that I should read it. The book was In Search of Secret India and the author was Paul Brunton! For a few moments I tried to recall the name, but eventually, when the scene at Mysore surfaced, I recounted the incident to my friend. That evening as the book, which gripped me from the start, vague doors seemed to open somewhere inside and very soon the author's other works, including Wisdont of the Overself, came to my hands in a mysterious fashion. Reading Hidden Teachings Beyond Yoga was a profound experience, as I had the strange feeling that here I was treading on familiar ground, something that I had known and understood in some forgotten past. It was the beginning of the Infinite Road. Very soon I found myself thrown out of employment, for being cheeky, with an extra month's pay in the pocket. At 21 years this was an exhilarating feeling of freedom with so much money to spend. Already numerous dreams were taking shape in the mind. But Grace had other plans and the book-thrusting office-mate appeared again saying calmly with a knowing smile on his face, saying "Now that you have the time and money, you should go and see the Maharshi." A few weeks later, I was in India again this lime at the feet of Sri Ramana in the company of a different group of 'tourists'! Major Chadwick was there, the Californian Rappold and another American lady, Arthur Osborne and a few others. The Ashram authorities very kindly extended the usual three days hospitality to a week, and then let me wait a further fortnight, arranging for me to stay with another Sri Lankan, Thambithurai, in the very hut of Paul Brunton near the pond! The two weeks passed too soon, with not too many visitors then, but every moment vibrant with Bhagavan's illumined presence. When departure time came and I took a tonga to the station one early dawn, a feeling of sadness overwhelmed mc. It was full moon as I stood at Villupuram for the connecting train, and it seemed as if Bhagavan's voice was reproachfully inquiring inside, "Son, whither art thou going?" Many summers have passed since then many summers full of professional activity and many travels out of homeland, including a second visit to the Ashram in December, 1970. Looking hack now it is easy to see the links connecting one event to another and realise that, with all the externalised activity, another journey began that day in the Pre¬sence of Bhagavan over 30 years ago an Inner Voyage of discovery where the Grace of the Supreme gave silent direction in the form of Sri Ramana as 'tourist guide'! After his samadhi, other lights shone and showed the way, like Sri Yogaswami of Jaffna and Poondi Swami, near Kalasapakkam, embodying in various names and forms the One majestic Grace. The more we control thought, activity and food, the more shall we be able to control sleep. But moderation ought to be the rule, as explained in the Gita, for the sadhaka (practiser). As explained in the book, sleep is the first obstacle for all sadhakas. The second obstacle is said to vikshepa or the sense objects of the world which divert one's attention. The third is said to be kashaya or thought in the mind about previous experiences with sense objects. The fourth ananda (bliss) is also called an obstacle, because in that state a feeling of separation from the source of ananda enabling the enjoyer to say, 'I am enjoying ananda' is present. Even this has to be surmounted and the final step of samadhana or samadhi has to be reached where one becomes ananda or one with the reality and the duality of enjoyer and enjoyment ceases in the ocean of Satchidananda (Existence-Consciousness-Bliss) or the Self." - From Gems from Bhagavan, p. 38. 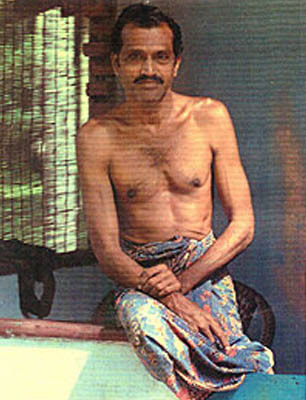 Among Yogaswami's admirers and dedicated devotees, Sam Wickramasinghe was exceptional, not only because he was Sinhalese by birth, but because he spent decades among other devotees (in Kathirkamam) and in solitude (at Guru Madam, island of Kayts in Jaffna District) endeavoring to penetrate into deeper and deeper levels of Yogaswami's multi-leveled deeds and utterances. Still lively and outspoken into his 80s, Sam was widely sought out by younger seekers for his colorful accounts of past experiences and exploits. He was also an accomplished writer, many of whose articles, such as this one, appeared over the years in the Sri Lankan English press.